Foodie news for the week of Nov. 26. Did you catch Arizona’s best and brightest chefs during Eight’s Centennial Cooking Celebration Tuesday night? Have you been to KISS, Old Town’s newest Chicago-style pizza joint? Tomorrow evening, Old Town’s Mabel’s on Main hosts Whiskey and Whiskers at 8 p.m. to benefit international charity, Movember. (Movember inspires men to grow their facial hair in support of men’s cancers during the month of November.) Mabel’s will donate $10 to the foundation for every man with a real mustache in attendance. A portion of proceeds from whiskey purchases will be donated as well. If a person doesn’t have a mustache or want to order whiskey, but still wants to contribute, they can donate $5 and receive 20 percent off their entire bill. Phoenix’s Crudo restaurant will host a special four-course Repeal Day-theme cocktail dinner this evening at 7 p.m. The $65 dinner starts with a tuna Waldorf and ends with Short Ribs “Diane.” Seats are limited; RSVP now to 602.358.8666. Tom’s Thumb Fresh Market in Phoenix turns its weekly wine tastings into a holiday party this evening from 5:30 to 7:30 p.m. For $20 at the door, guests can sample five wines recommended for holiday meals and parties and a range of appetizers available the store. Vegans want pizza, too. And NYPD Pizza is making that a reality for them. 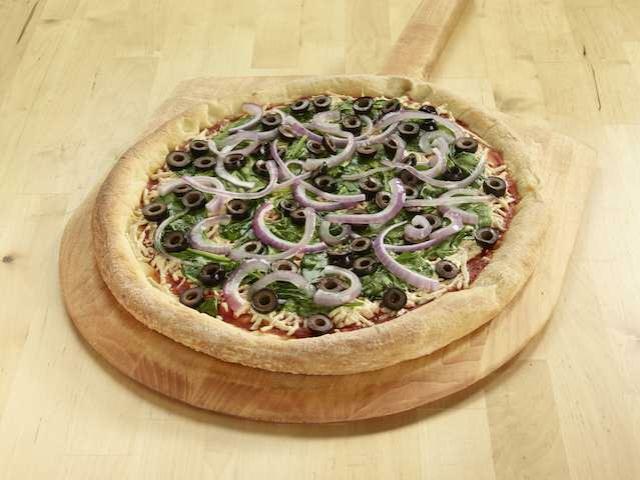 In honor of World Vegan Month (November), the locally-owned and operated company has rolled out its new Veganizza (pictured). A gluten-free variety is also now available at eight of NYPD’s 10 local outposts. On Thursday, Dec. 6, J&G Steakhouse at The Phoenician will be hosting a multi-course, wine-paired dinner with Palmaz wines. The dinner starts at 6:30 p.m. and is $95 per person, plus tax and gratuity. For reservations, call 480.214.8000. For more fab foodie news, follow us on Twitter @AZFoothillsFood, become a fan on Facebook and check us out on Pinterest.